Is your computer not booting into Windows? Are you pressing the power button but no lights are coming on? Maybe there is a strange beeping sound coming from your computer. These problems can be extremely frustrating. Think of us as your own personal IT department – available when you need us most. 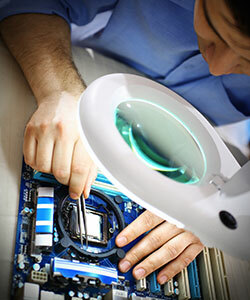 Our technicians can tackle computer repair, new computer setup, software and operating system upgrades, spyware, and virus removal and other frustrating computer problems. Fill out the contact form or call our office at 812-634-8001 and you will be directed to our service department. Eck-Mundy is here to help!